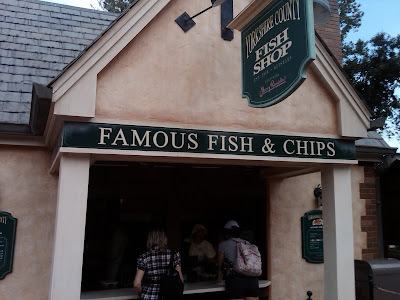 This is a small fish and chips stand right next to the Rose and the Crown, the English pub/restaurant in the United Kingdom section of World Showcase at Epcot in Walt Disney World. If you think that’s a mouthful, finding out the name of this place is even worse. It’s a bit of a word puzzle in itself. Officially, it’s the Yorkshire Fish Shop featuring Harry Ramsden’s. The sign over the shop says almost that, the sign over the window says Famous Fish & Chips. The building is attached to the Rose and the Crown. 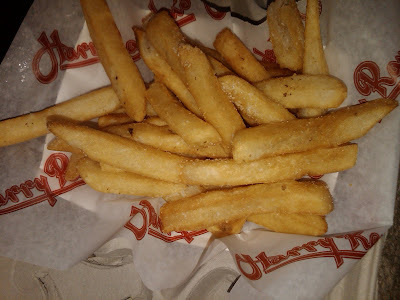 The wax paper says Harry Ramsden’s and the tray the chips lie in says Walt Disney World. The receipt says U.K. Fish & Chips Kiosk. Your guess is as good as mine. The chips themselves are definitely British chips, almost but not quite as good as those at Cookes of Dublin. 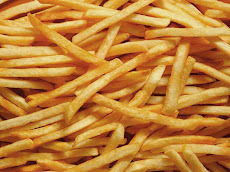 The chips are extra thick regular cuts, served quickly, hot and fresh. They’re not perfect, but damned good, a bit crisp, not a bit greasy, hot inside and out. The service is great, with an English accent, of course. As I said, this place is right next to the Rose and the Crown. Sixteen years ago on my first trip to Disney World we had dinner there. I remember those chips being quite good, but they came with something resembling boiled steak. We came to the conclusion the food was UK authentic, as all UK food is supposedly bland. I checked the menu for the place while I was there – no boiled steak. Maybe we’ll try the place again, next time.